I was at the border, a British national with an Arab name on my way into Palestine-Israel. The Jordanians were suspicious but not at all intimidating. It felt more like an unexpected cup of tea with an avuncular officer (which it was) than an interrogation. I learnt about Abu Tariq’s children and he learned about my reasons for crossing, my travels, and my career. He noted everything down before shaking my hand. The bus through no-man’s land was full of Palestinian-Israelis, descendants of the remnant not driven out in 1948 – those the Israelis call ‘Arab-Israelis’, as if they were recent immigrants from Kuwait or Algeria. The sun bubbled the box of our bus. It was airless and sweaty inside. Israeli border control is staffed by teenaged girls in low-slung military trousers backed up by men with sunglasses and enormous guns. The girls clocked my (Arabic) name, and my bags were searched. Then I was closely questioned. Then I had to wait. Fortunately it was Yom Kippur: they let me through an hour later when they closed up early. Then by car through the the ethnically-cleansed city of Beesan (signposted in Arabic script with the Hebrew name – Beit She’an), and into the West Bank. The roadsigns here are very democratically scripted in Hebrew, English and Arabic, except for those in Hebrew only. But Palestinian towns and villages are never posted. A visitor travelling a Jews-only road wouldn’t realise that such places exist. Jerusalem is written in Arabic as “Urushaleem,” and then between brackets “al-Quds”, which is the actual, ancient and contemporary Arab name. In such ways the attempt is made to occupy the land’s abstract Arab qualities, to control history and memory, the past as well as the present and future. 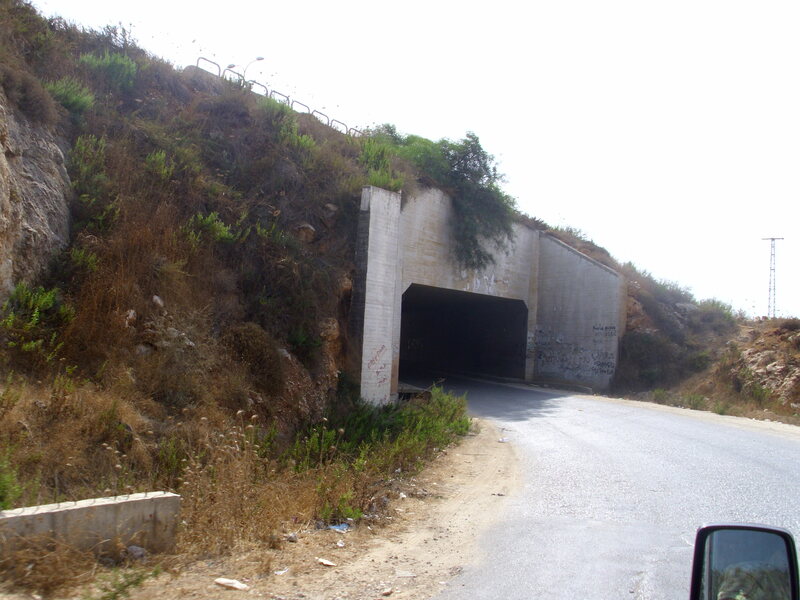 In Nablus I stayed near a graveyard housing tens of young men shot dead at checkpoints. At the checkpoint on the mountainside, blocking the entrance to the Samaritan village, two soldiers – of European and Ethiopian origin – mistook me for a Palestinian. “Roo!” they bellowed. “Roo!” “I speak English!” I squealed, waving my passport. They gestured for me to approach. “You’re English?” asked the European. “So why are you brown?” “From the sun,” I said with a foolish grin, and they let me through. The Samaritans are Palestinians, but their religion, an ancient form of Judaism, makes them a tolerated people in Israeli eyes. Their village felt like another country. Israelis arrived on their own road to stroll the Byzantine ruins on the hilltop. 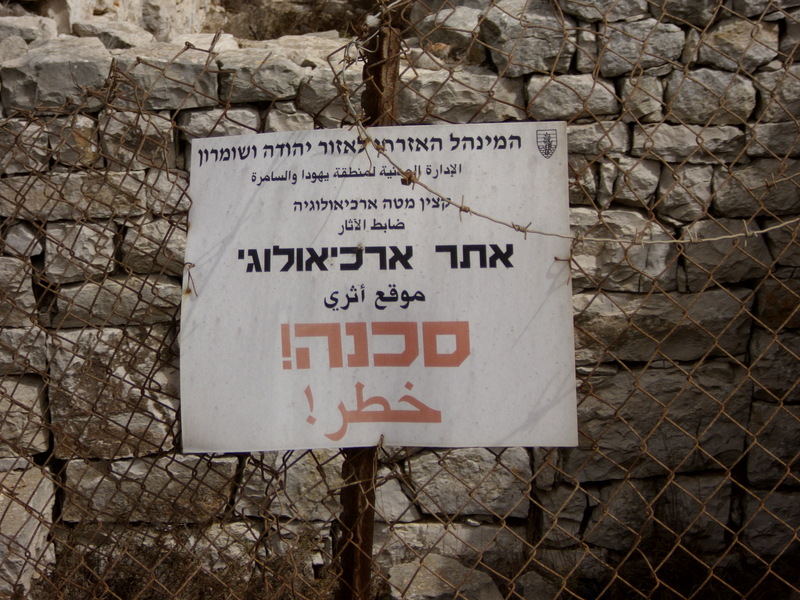 Signs in Arabic advertised ‘the Civil Administration of Judea and Samaria’. A group of American tourists sat panting in the shade, drinking beer. I wondered how many knew there was a city choking down the slope. Beer drew a group of European teachers to the Taybeh Octoberfest. Taybeh is a Christian village near Ramallah which brews its own brand. On the way home the teachers’ bus was stopped. “Why are you going to Nablus?” the Israelis demanded. The full-bellied foreigners said they were religious tourists, residing in a Nablus church. One made the mistake of smiling. An Israeli squeezed his neck until he admitted nothing was funny. Settlers, of course, have gleaming checkpoint-free highways to take them anywhere in the country except Gaza. West Bank Palestinians are forbidden entry to Jerusalem, Gaza and Israel proper. So on my way out I hired a driver with a Jerusalem ID. This document allowed him to drive me from Ramallah up the confiscated Jordan valley to Beesan and then the border. He was clean-shaven and light-skinned. No political symbols decorated his Israeli-plated car. At the first checkpoint he greeted the soldiers in perfect Hebrew, and we passed. 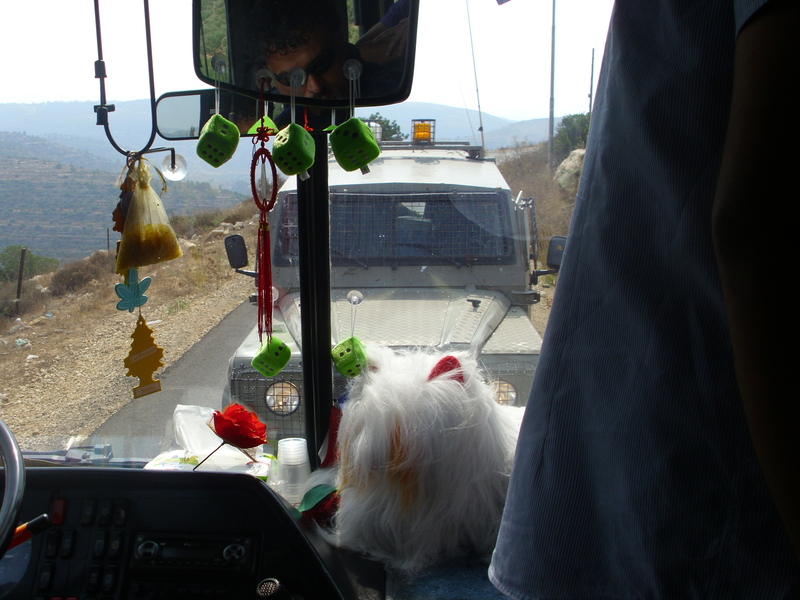 But at the checkpoint exiting the West Bank the soldiers examined the driver through narrowed eyes. They asked his name. They asked my name. An officer spoke into a radio. We were pulled over, searched and interrogated. My bag was passed through a machine and then emptied. The driver was body-searched. A Palestinian-Israeli family, dressed traditionally, also underwent the procedure. So did a woman dressed in high heels and make-up, another Israeli passport holder, with Hebrew books in her bag, travelling alone. What we all had in common, as well as Israeli plates on our vehicles, was Arab names. Jews whizzed through the checkpoint. Jews travel freely while Palestinians wait. Jews carry guns (and often use them). Jews build while Palestinian homes are demolished. In the West Bank as in the rest of Israel-Palestine, Palestinian populations are squeezed between Jewish settlements. Their land and water is confiscated. The settlements shadow every hill top. During my visit I couldn’t find a clear territorial distinction between Israel and the West Bank. The only distinction I saw was an apartheid distinction, between the two peoples living on the land.